I didn’t see writer-director John Carney’s 2007 “Once” (which was adapted into a Broadway musical that won eight Tony Awards) and 2014 “Begin Again” until they were on DVD. Both were among my favorite films of their respective release years, so I made it a point to see his next feature when it released on the big screen. I wasn’t disappointed. Like “Once” and “Begin Again”, “Sing Street” is a music-driven romantic movie where the lead characters come with relationship baggage or acquire it along the way. The setting is Dublin (like “Once”) in the mid-1980’s, and the musical backdrop is primarily British new wave. 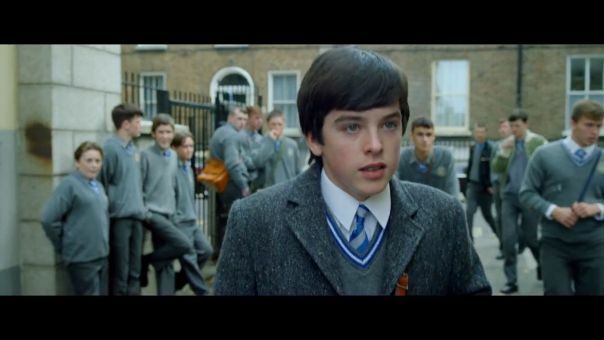 Conor (newcomer Ferdia Walsh-Peelo), in his mid-teens, is moved from an expensive school to no-cost Synge Street School because of his father’s (Aiden Gillen) financial problems. In addition, Conor’s parents (Maria Doyle Kennedy plays the mother) are having marital problems, and his older brother Brendan (Jack Reynor, who bears a resemblance to Seth Rogen) dropped out of college, lives at home and spends his time smoking hash and listening to music. In an early scene that sets the tone for the film, Brendan uses the music video for Duran Duran’s “Rio” (above right) to explain to his family, specifically Conor, the new medium is a legitimate and exciting art form combining both music and visual storytelling. Their father disparages the music, the band’s look and the fact they are not actually performing the song. A point not lost on Conor is Brendan’s mention that girls are wildly attracted to Duran Duran’s guitarist, John Taylor. At his new school, Conor faces bullies in the form of the school’s strict principal, Brother Baxter (Don Wycherly), and a fellow student. The interaction with the student bully introduces Conor to Darren, a pragmatist who takes the bullying in stride as part of being at the school. While at the school, Conor notices Raphina (Lucy Boynton), a beautiful girl about his age, standing on steps across the street and starts a conversation (left). To ingratiate himself with Raphina, Conor asks if she’s a model (the only time that line has ever been used) and says he wants her to be in a music video for his band, which didn’t exist prior to their conversation. Conor explains his predicament to Darren, who wants to be manager, and the two get started on gathering members for the band (which they name Sing Street), starting with all-around musician Eamon (Mark McKenna), who teaches guitar to Conor, who will front the band. At the urging of Brendan, the band eschews being yet another cover band and they write their own music. 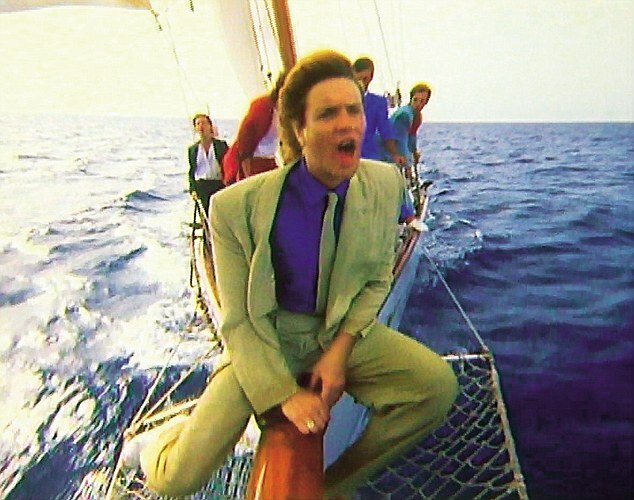 Wearing unintentionally hilarious costumes (above right) emulating Duran Duran, the band makes music videos featuring Raphina, who takes it upon herself to handle the band’s costume and makeup, which Conor carries over into his day-to-day life. During the process, Conor is disappointed to find out Raphina has a boyfriend, who is older and drives a car, a big deal for someone that age. 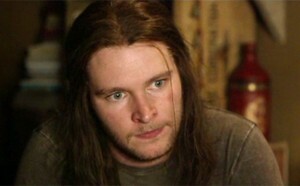 The culmination of the film is the band’s big opportunity to bring their music public by playing at a school dance, which also gives Conor (who Raphina has renamed “Cosmo”, to fit his new image) the chance to get revenge on Brother Baxter. The climactic school dance is an homage to the 1985 Robert Zemekis film, “Back to the Future”, complete with a Doc Brown character in the background. Part of it includes a fantasy scene that reminds me of Herbert Ross’ 1981 “Pennies from Heaven”, where the flashy musical numbers are a break from the downward-spiraling, bleak depression-era story line. Regarding the film’s time setting, the way Brendan explains the “Rio” video implies the video was just released and later there’s a reference to Michael Jackson’s “Thriller.” Both came out in 1982. During one of the music practice sessions, Eamon plays Harold Faltermeyer’s “Axel F”, even though “Beverly Hills Cop” didn’t come out until 1984. I found that inconsistent. I also had to suspend disbelief with the relationship between Conor/Cosmo and Raphina because she seems so much more mature (Boynton is in fact eight years older than Walsh-Peelo). All the performances are honest and the relatively low profile of even the most accomplished cast members helps give the story authenticity. The Dublin shots are probably as beautiful as I’ve seen of the city. The use of music, especially when it’s being performed onscreen (like “Once” and “Begin Again”), is not only significant to the story but it injects tremendous energy into the viewing experience. There’s something satisfying on a primal level about seeing good music performed. Without really presenting itself as a musical, that’s really what “Sing Street” is at its core. A musical with a solid dramatic, comedic and very human and personal story. Other elements the film shares with “Once” and “Begin Again” are points where the lead relationship looks like it will end and there are boisterous and homey party/dinner scenes where music plays a big part. “Begin Again” features scenes where songs are recorded in various locations (without permission) throughout New York City. 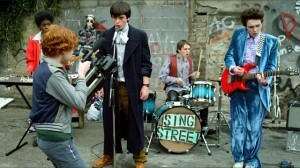 In “Sing Street”, the band shoots their music videos around Dublin the same way. In “Once” and “Sing Street”, a parent of one of the musicians brings in food or something to drink while the musicians practice. The scenes emphasize the intimate and personal tone all the films share and the character and variety of their backdrops. 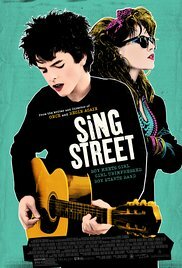 One difference that sets “Sing Street” apart from the other two is there is no standout song, like “Falling Slowly” (Best Song Oscar winner from “Once”) and “Lost Stars” from “Begin Again”, although the original songs are all good. 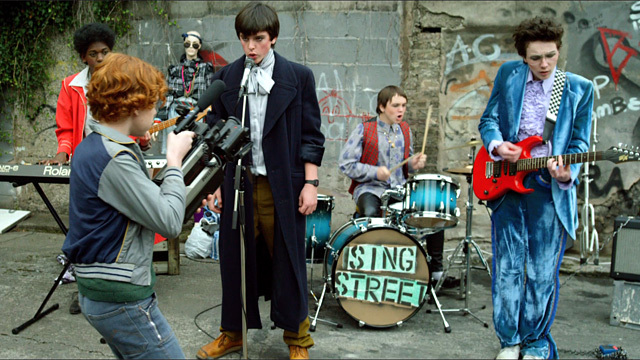 While “Sing Street” shares similarities with Alan Parker’s 1991 “The Commitments”, Carney has commented that, while he thought it was a good film and script, it didn’t influence him in any way. By coincidence, Kennedy played a lead in “The Commitments” and Glen Hansard, the lead from “Once”, had a small role. 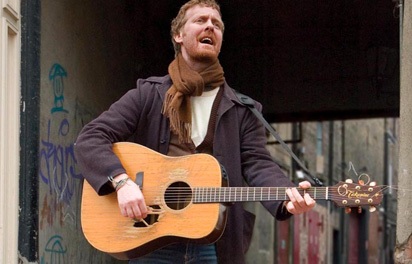 In Hansard’s final appearance in “The Commitments”, he’s busking on the streets of Dublin, which is the same thing he’s doing in the opening scene of “Once” (right). While I’m on the topic of connections, Carney played bass (1990-1993) for the Irish band The Frames, which was fronted by Hansard. 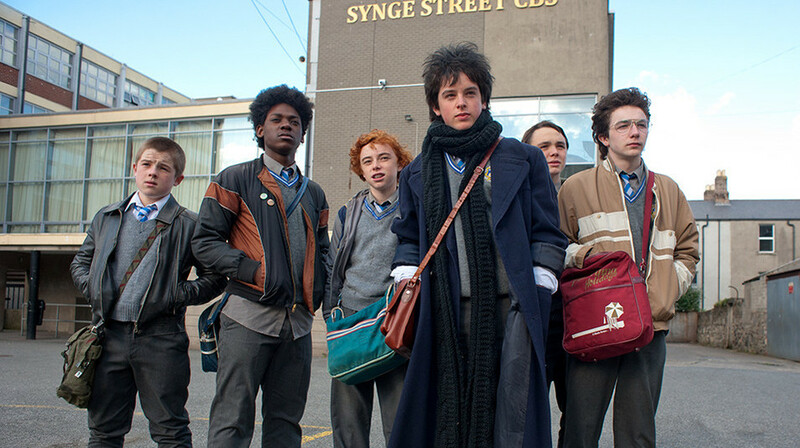 While I’ve given more of the plot than I usually do, there’s so much more that happens in “Sing Street” that cover a wide range of emotions, from awkward to hilarious to sad. Except for Carolan, none of the Irish accents were too thick to understand. The audience would have benefitted from subtitles during some of his dialogue. What I did understand of it made me laugh. While I usually don’t care for directors repeating plot lines, devices and elements from their own work, the way Carney does it works for me. The characters have depth, are likeable and I care about what happens to them. I enjoy the music and the way it’s used in the movie and the rawness of the way the movies look (primarily handheld shots). Carney also is adept at romantic stories that don’t rely on the schmaltziness that a lot of romantic movies resort to. I guess the word I’m implying here is “charm.” Satisfying and enjoyable on every level, “Sing Street” is a film I recommend highly, especially for a date night. A guy I worked with in the film industry was an aspiring musician that moved to LA in the late 1980’s from the Midwest. He had an older brother that preceded him in moving to LA a few years earlier to get into entertainment as well. 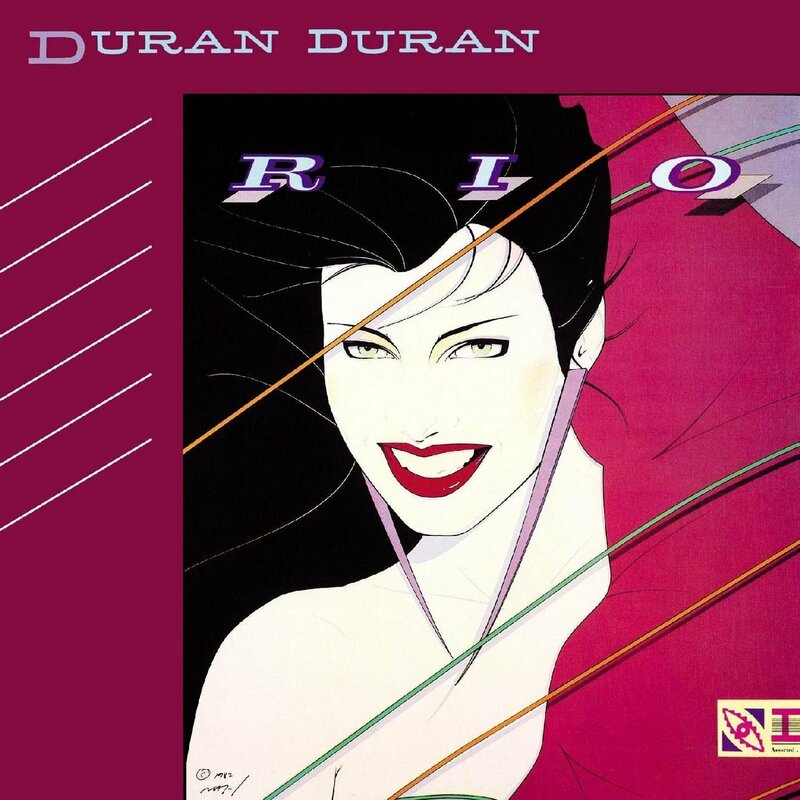 While in high school, the brother fell for a girl and, in order to impress her, formed a Duran Duran (a group he obsessed over) cover band, complete with hair, clothes and makeup. After his move to LA, the brother eventually became an associate film producer and protege of a big-name producer and had himself produced some low-budget films. One of the films was shot in his hometown so he could show the people he grew up with how he “made it.” His father was a local entertainment personality and, between the two, they did everything they could to promote the film shoot in advance to the point it became an event for the city. It got daily press coverage during the shoot. Based on those anecdotes, the brother’s insecurities and need for validation struck me as extreme. Hiding behind a rock star’s persona to win over a girl might sound romantic, but it shows the guy wasn’t confident that just being himself was enough. A few years after I left the film industry, my buddy emailed me to tell me his brother had committed suicide. The guy was smart, had a reasonably successful Hollywood career and, in the words of my buddy, “drove a Lotus and had the actress girlfriend”, so the suicide was shocking to everyone who knew him. He was only 40 years old. 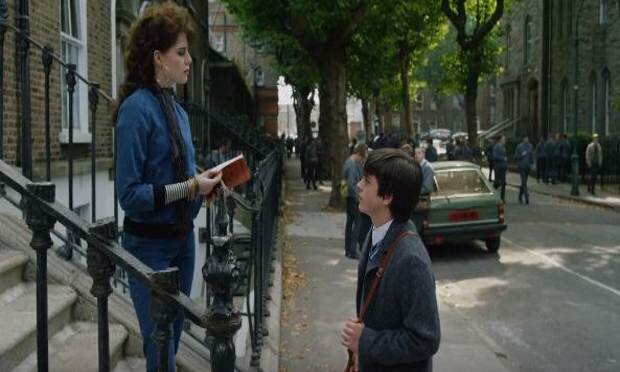 I couldn’t help but think of the brother during the Duran Duran scenes in “Sing Street”. The parallels between the story line and what this guy’s brother did were so eerie I tensed up during those parts of the film. I can only imagine my buddy’s reaction when he watches the film.